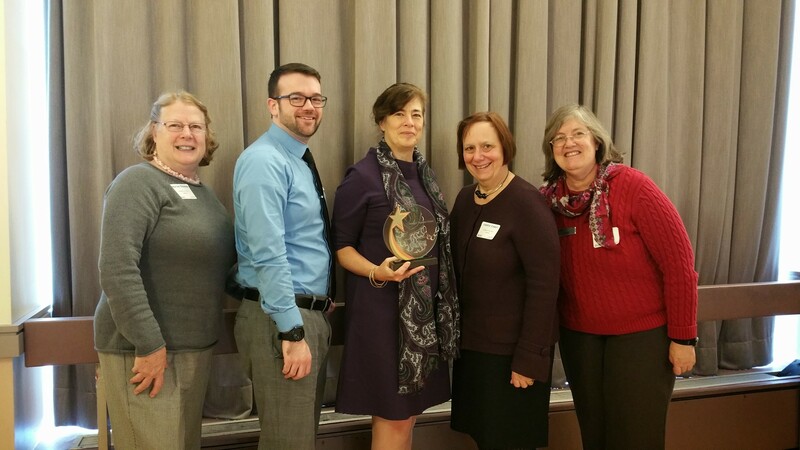 The Massachusetts Library System (MLS) bestowed the first ever Stronger Together Award upon the Wellesley Free Library. The Stronger Together Award celebrates a Massachusetts library or group of libraries, an individual or group of individuals, or a professional organization that contributes to strengthening the Massachusetts library community. Wellesley Free Library was chosen for its contributions serving on professional committees, sharing best practices of progressive children’s services, broad programming to immigrant populations, active support of the Massachusetts eBook Pilot Project and grassroots efforts to support career networking. This work was actively shared widely. “We are pleased to present this award to the Wellesley Free Library because its staff reached outside their traditional community to promote high-quality library services across the Commonwealth,” said Greg Pronevitz, MLS Executive Director. Representatives of the Wellesley Free Library receive the Stronger Together Award. OCLC library data now supplementing Yelp.com listings to improve public access to library information. Ten archivists and curators from the US and the UK collaborated to create “Born Digital: Guidance for Donors, Dealers and Archive Repositories.” The report offers separate recommendations for repository staff and donors/dealers in differnt topics: initial collection review, privacy and intellectual property, key stages in acquiring digital materials and post-acquisition review by a repository. This report offers recommendations to help ensure the physical and intellectual well-being of born-digital materials transferred from donors to archival repositories. The report surveys the primary issues and concerns related to born-digital acquisitions and is intended for a broad audience with varying levels of interest and expertise, including donors, dealers, and repository staff.